Our fiberglass pergolas are the World’s first structural fiberglass pergolas and are pound for pound stronger than steel but lighter than wood. They will never rot, melt, bow, warp, rattle in the wind, or get infested with insects and are 100% made in America. Our fiberglass pergolas are the World’s first structural fiberglass pergolas and are pound for pound stronger than steel but lighter than wood. They will never rot, melt, bow, warp, rattle in the wind, or get infested with insects and are 100% made in America. 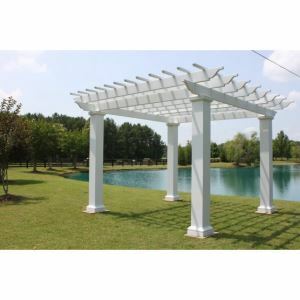 We offer our pergola kits and custom designs in paint-grade versions or infinite prefinished color options. Round and Square columns are available. 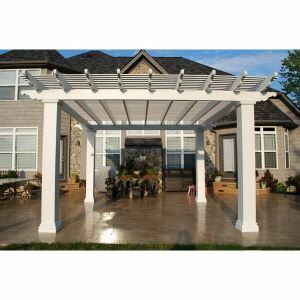 We don’t offer pergolas made from any other materials because this pergola is unrivaled. Our fiberglass pergolas, arbors, and trellises are comprised of rafters, purlins, rafter tails, and often architectural columns. These components are made through the process of pultrusion just like our RoyaLite™ square load-bearing columns. Pultrusion is the process of pulling rather than pushing a continuous fiberglass reinforced structural shape through a heated forming die. The mixture consists of polyester resin, filler, and fiberglass, which results in a very strong product once cured. 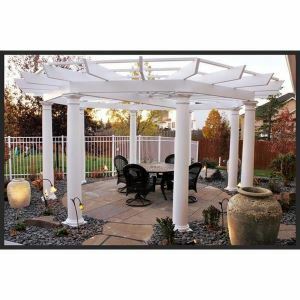 We only offer fiberglass pergolas because they are unrivaled in every aspect. Wood will sag under its own weight and vinyl will sag due to variations in temperature not to mention the flimsy nature and cheap look of vinyl. 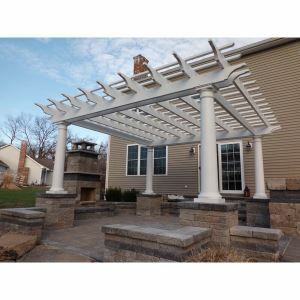 Our stock pergola kits are wind load rated and due to their high strength to weight ratio, they can span longer distances than any of these inferior materials. Fiberglass reinforced composite products are naturally resistant to corrosion so there is no worry of rust or corrosion. Unlike wood and vinyl, fiberglass will maintain its full strength over its lifetime because it doesn’t warp, bow, or twist. As if all of this was not enough, our kits are easy to install as all parts are clearly marked and everything is predrilled. As with all of our products, our pergolas come with a limited lifetime warranty and there is no better assurance than that. 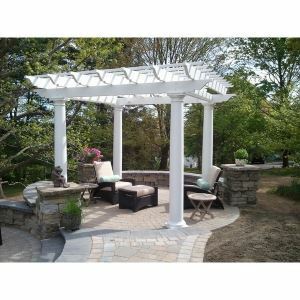 We offer stock pergola kits, pre-designed pergolas, custom pergolas, privacy screens, trellises, and swing/entry arbors. 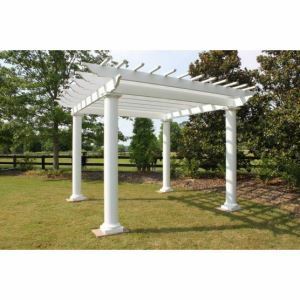 Pergola kits come in overhead dimensions of 12’ x 12’, 14’ x 14’, and 16’ x 16’ with the option of round non-tapered or square non-tapered columns. These kits are in stock and will ship within one week with all the necessary hardware in our white color and 2-3 weeks in custom colors. Standard kits are rated for 90 MPH wind load but with our wind load plates, you can achieve 160 MPH. 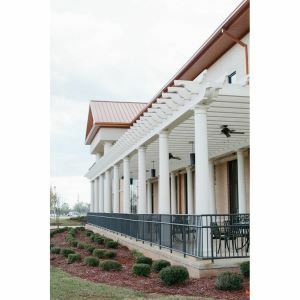 Our stock pergolas come with Spartan style rafter tails; however, when customizing, we offer many standard rafter tails to choose from. We don’t offer cheap snap on rafter tails: All of our tails are routed into our rafters. So when it comes to free standing or attached and custom or standard pergolas, there is no better choice than our fiberglass pergolas.